It seems a long time ago that I contributed to the design of the new Clifton Hunter High School in Grand Cayman, Cayman Islands as Senior Education Advisor to the Minister. However, the new building went into operation this term and, guess what, the students love it, as do the may members of the public who have seen it. It was one of three high schools designed, two of which are being built. The design work was undertaken under the previous very brave Minister of Education, Hon. Alden McLaughlin who took a personal interest in the Third Millennium development and based on a concept design by Prakash Nair (Fielding Nair) and designed by Cannon Design and feature in 'The Third Teacher' book. Professor Stephen Heppell also played a lead consultative role. Aspects of the design did break boundaries in concept, but with a change of government after my departure it is now not as 'brave' ` design as was intended. People often retreat when really they should drive forward. the progress of the young people would really surprise them! It is especially possible in small countries like Cayman. However it is interesting to see the current Minister applaud the design. 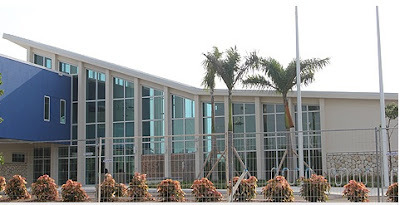 Having also taught in the Cayman Islands was well as being a High School Principal there, I know just how fantastic these facilities are in comparison compared to the ones they had. However, given time and confidence, there is always the potential to revert to the original vision. What is clear, is that the new facilities are causing a real pride amongst students with will surely reflect i the learning that takes place. I would love to go and visit them - I wonder if I will get the chance! I feel compelled to post a comment about the item about the opening of the new Clifton Hunter High School. I should like to comment on two facets of the site. One, with which I shall begin, is not a matter of opinion, but of fact. The official figure for the construction costs for the new school is a hundred and twenty-five million U.S. dollars. I have it on good authority that the electrical utility costs are a hundred and twenty-five thousand U.S. dollars per month. Construction has resumed on the new John Gray High School, which should cost more, as there are scheduled to be four academies on the site, not three as there are at Clifton Hunter. Therefore, the design team that produced the plan for the new school burdened the Government of the Cayman Islands with a debt of over two hundred and fifty million dollars for the new schools and running costs in excess of three million dollars per annum. The second aspect of the school design is an assessment of the fitness of the design; to what extent form follows function. This is, I submit, a matter of opinion. However, two features of the initial design are not a matter of judgment. As a matter of fact, the design included a ‘Da Vinci Studio’ where Science and Art lessons would take place. I presume that the architect wanted to encourage the process of symbiosis, the two disciplines helping and supporting each other. It would appear that the inspiration for this was the life and work of Leonardo Da Vinci, an extraordinary polymath. However, four hundred and ninety-three years’ after his death, students need to pass external exams including one of the core subjects, Science. The laboratory experiences necessary for modern, investigative Science have absolutely nothing in common with Art, another subject that students can obtain an external examination qualification. In order for teaching and learning to take place in these two subjects, the design had to be changed. As it is now, two Science classes have to take place simultaneously, in rooms with two-storey high ceilings. I imagine it is very distracting for staff and students alike. The second feature of the design that needed attention to bring the facility up to standard was to make adjustments to allow Home Economics classes to take place. This is another area where exam classes like Food and Nutrition, Child Care and the like are taught. I gather no provision was made for classrooms to house these disciplines. Lastly, I gather that the basis for the design of the Learning Spaces was that they should be ‘Agile’. ‘Cells and Bells’ were to be left behind and the ‘New Paradigm’ would have wide-open spaces without corridors to waste space. How students would be able to withstand the temptation to lose focus on learning was never clear. Artist’s impressions had two or three students strolling through the agile learning space, not a class of twenty-five concentrating on passing their exams. It is on this basis that many have described the ‘open plan’ academies as ‘not fit for purpose’. Thank you for your comments. Obviously you would not expect me to agree with all of them but I am pleased that you took the time to comment. An obvious point re cost is that the NHC did insist that the buildings were able to act as hurricane shelters to withstand category 5 storms such as Hurricane Ivan. We all know what that did to the schools. However, to build to this incredibly tough standard and provide much needed additional hurricane shelter capacity, complete with catering provision comes at a massive additional cost. They were also deigned to provide much needed sporting and cultural opportunities to the east of the island where there were previously no such provision. Comments about pedagogy can and will doubtless be discussed for ever, but needless to say the idea of super labs and agile learning areas are in use in lots of schools with resulting improvement in student academic attainment. But, thank you for commenting. I have experience of teaching in open-plan high schools with 'agile learning spaces' and two science labs per 1200 pupils. I have also had great difficulty keeping a class of 25 pupils focused while a completely different lesson went on next to us. Even more difficult when they are different ability levels. If these places keep being built then there needs to be a completely different approach to what outcomes are wanted. But while governments just want exam results they will never be 'fit for purpose'.